My Neapolitan grandmother (or ‘nonna’ as the Italians would say) married a British officer posted in Naples in 1944. It is quite likely that Norman Lewis, an Intelligence Officer also there at that time, would have had to interview both of my grandparents to judge the suitability of the match. Marriage with Italian civilians was discouraged and lots of officers who applied for permission were turned down and sent away from Naples. So really, my grandparents were lucky. I have always been interested in my grandmother’s home country and after her death a couple of years ago, I have only ever become more curious about the city she grew up in. After marrying my grandfather, she moved to England and only returned to Naples for holidays a couple of times a year. So when she told stories about Naples, it was always about the ‘old days’ before and during the Second World War. She spoke of terrible encounters with the German soldiers and merry parties with the British and Americans. She also told of the hunger and poverty her family lived in. My grandmother was one of the lucky ones who found a job working for the British, whereas many others had to resort to prostitution in exchange for food and clothes. 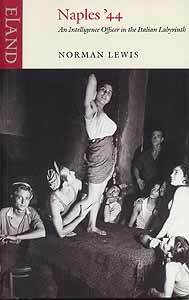 In fact, Norman Lewis describes how a huge outbreak of syphilis lead to an operation, where large amounts of women were arrested and forced to be examined for sexually transmitted diseases. If any results came back positive, the woman would be kept in hospital, usually against their will, and treated. This was to stop the diseases spreading among the British and Americans, who enjoyed spending their free time with their mistresses. The Naples of 1944 is very different to the Naples that I know. I have found Lewis’ account of his time there very interesting, not only because it captures a year in history that my grandmother would have lived through, but also because it shows how different it was six decades ago. The poverty stricken Naples that Lewis lived in was comparable to the medieval times. The streets were dirty, the civilians unclean and starving, peasant children roamed the piazzas searching for scraps of food. Diseases such as small pox, typhoid fever and malaria spread quickly causing many fatalities. Even the beliefs and superstitions of the Italian people could be seen as medieval. Lewis mentions ‘the evil eye’ and many odd rituals to protect oneself. For example, a man cupping his testicles with the left hand was supposed to protect him from evil and bad luck. Walking around Naples last week whilst on holiday, I (thankfully) did not witness anything like this! Lewis’ book conveys the grim reality of Naples in 1944, but it is also full of positive memories. He made a lot of Italian friends; Lattarullo, an out of work lawyer being my particular favourite, who scraped a living by acting as a Roman uncle at funerals. Lewis became very fond of Italian life, culture and particularly the people, who he came to respect for their ability to cope through all situations and keep true to their beliefs and traditions, however odd. As Lewis says, “were I given the chance to be born again, Italy would be the country of my choice”. And I find it hard to disagree after living there a couple years ago myself. Through Naples ’44, which is beautifully written as a journal recording Lewis’ day to day work activities, we get an invaluable insight into a city that had been devastated by the effects of war. Read about other books set in Italy!